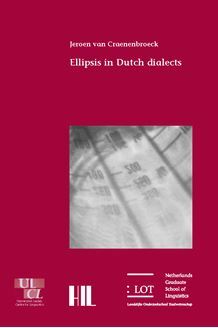 Ellipsis in Dutch dialects investigates a number of elliptical constructions found in Dutch dialects within the framework of the Minimalist Program. It is argued that both the PF-deletion and the pro-theory of ellipsis are needed to account for the full range of elliptical phenomena attested in natural language. This study consists of two parts. The first one focuses on two cases of stranding to the right of a sluiced wh-phrase: prepositions in English (What about?) and demonstrative pronouns in Southern Dutch dialects (Wie dat? ‘who that’). Both these phenomena are given a PF-deletion analysis, which turns out to have considerable repercussions for the structure of the left periphery and the syntax of wh-movement. Specifically, while minimal wh-phrases move from their IP-internal base position to specCP, complex ones are base-generated in the (split) left periphery. The second part is concerned with Short Do Replies in Southern Dutch dialects, a type of contradictory replies which at first sight bears a close resemblance to English VP-ellipsis. It is shown that in this case the ellipsis site is best represented as a null, structureless proform, which is licensed by the head of a high NegP. Moreover, this pronominal is argued to occur in two other dialectal constructions as well: contradictory replies of the type Da’s nie ‘that.is not’ found in Brabant Dutch, and the occurrence of subject clitics and agreement endings on the words for yes and no in Southern Dutch dialects (e.g. Ja-n-s ‘yes-PLURAL-they’). This study is of relevance to anyone interested in the syntax of ellipsis, the left periphery or wh-movement, or in the study of Dutch dialects.